Home BlogThe Psychology of E-Commerce Sales. Finding Your Way to Conversion BLISS! 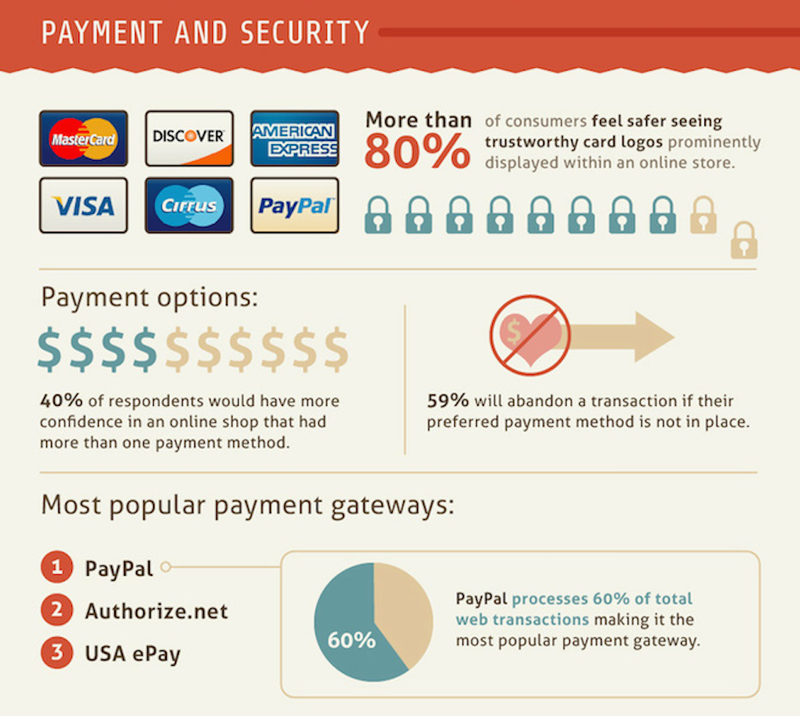 This article is based on Vouchercloud Infographic, which digs into the psychology of the online consumer. Beyond site speed, they look at the impact of design, product reviews, checkout abandonment, coupons and deals, shipping, and payment and security on online shoppers. We list (and explain) the 7 most important points… Feel free click the original link for further information. BE QUICK TO GET THE CLICKS! 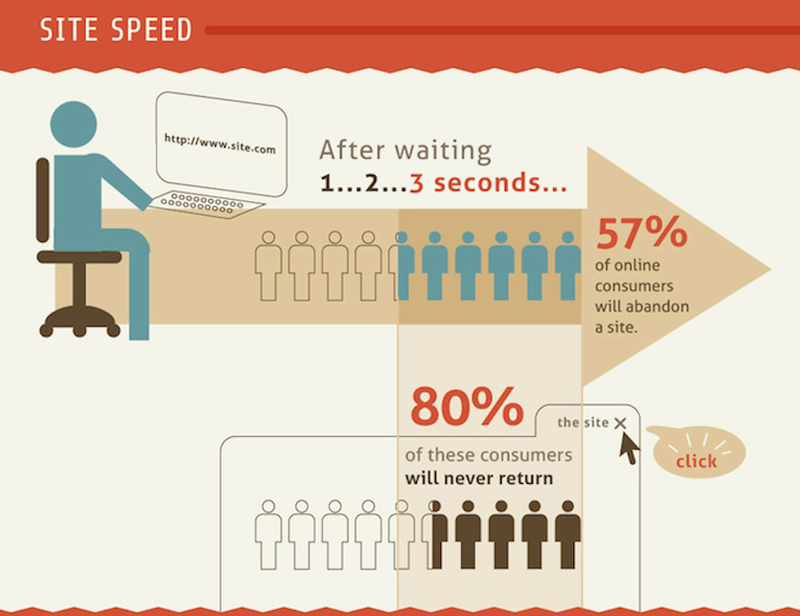 Online consumers are not patient people and, after waiting just three seconds, 57% of online consumers will abandon a website. 80% of them will never return. Make sure your online store is optimised for easy and quick browsing. Just as we judge people within seconds of first meeting them, website visitors also make snap decisions on whether a company looks trustworthy. If the web design looks dated, has broken elements and just looks a bit substandard, customers may assume the products or services are a bit substandard too. In fact, more than 90% of consumers claimed a website’s visuals are the top factor affecting their purchase decision. Accepting the lead of a good UX design agency does pay off! Good design and User Experience will not only guarantee you beautiful landing pages, it will also help your website push your clients through the sales process much smoother. USE PRODUCTS IMAGES AND VIDEOS! Sometimes a picture really does speak a thousand words and will help customer retention and attention rates. 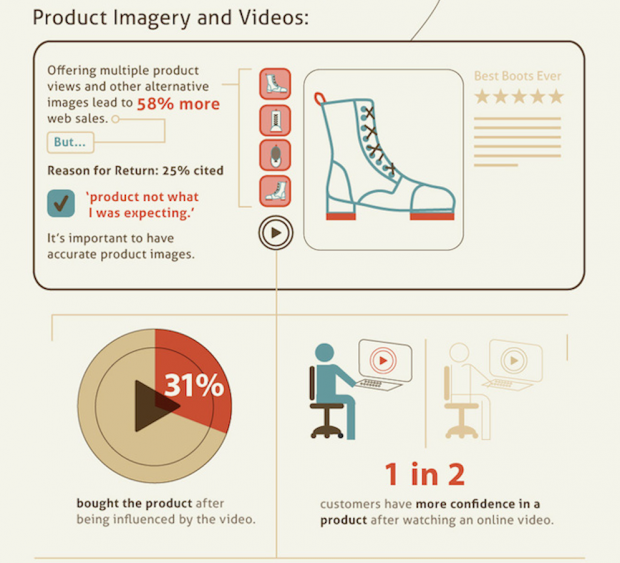 Offering multiple product views and quality images leads to 58% more web sales on average and helps stores avoid customers who may claim the product they purchased is not entirely what they were expecting. Product videos are also incredibly useful as 31% of consumers claim that a product video has positively influenced their decision to purchase; one in two online customers claim to have more confidence in a product after watching an online video. Provide well-written and concise content to tell customers everything they need to know about your product or service. “Quality product descriptions can transform E-Commerce conversion rates — it’s common to see increases of 30-100%. As well as converting more visitors, search traffic increases drastically when unique copy is written for each product”. Your visitors have an attention span of about eight seconds when scanning a website for information, so make sure all of the important information is readily available. The content in your E-Commerce site needs to be more than just a flock of words. It needs to be concise, it needs a goal and it needs to breathe life. Endorsements from other customers are a great way to build trust in others. Be prepared to ask your current customers to provide reviews about the great service they have received and then get these statements added to your website. 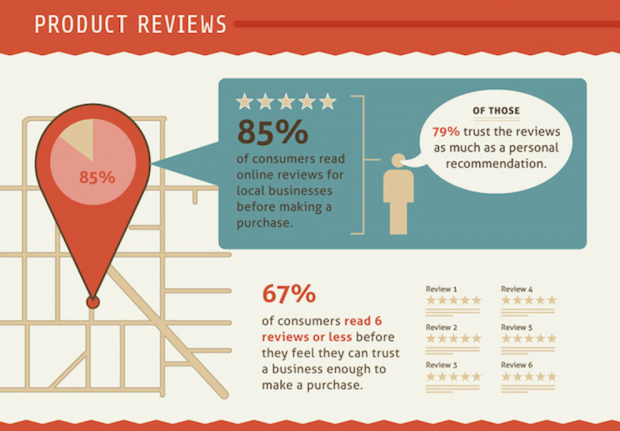 A massive 85% of consumers read online reviews for local businesses before making a purchase and almost 80% trust reviews as much as a personal recommendation. KEEP IT SIMPLE AT THE CHECKOUT! Two fifths of consumers have more confidence in an online shop that has more than one payment method and almost three fifths will abandon a transaction if their preferred payment option is not available. Make sure you have as many payment options as possible and display trustworthy card logos prominently on the website. Good web-design and UX design is a necessary step that needs to be explored, implemented and tested for results. It’s an initial investment your E-Commerce website needs, to be able to provide the acceptable levels of trust and usability that will make your Business sustainable in the long-term. So make sure you talk to the right professionals. Request a Free Evaluation ! 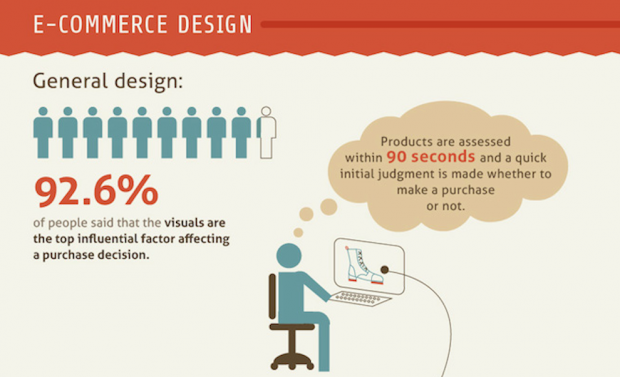 And if you willing to go deeper in the subject, there’s a great article by Smashing Magazine: “15 Most Common Mistakes in E-Commerce Design”. Enjoy ! Have you enjoyed this reading (or not)? …. LEAVE US A COMMENT.